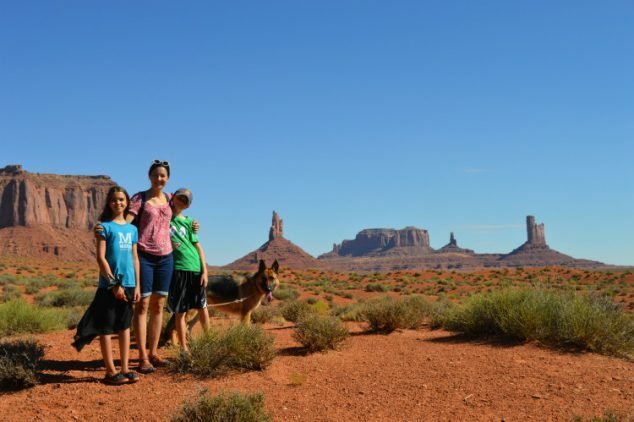 Last summer we brought our dog on a three week road trip family vacation- you can see my Southwest road trip itinerary here. We absolutely loved taking our dog on vacation with us but we realize it is not the right choice for everyone. 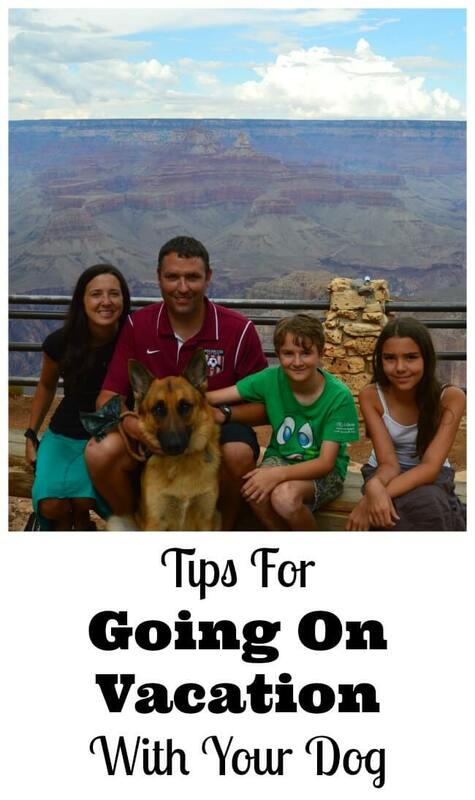 I have had lots of people ask me, “Should you go on vacation with your dog?” If you are thinking about traveling with your family pet, here are my best travel tips for pets. Scout checking out the Grand Canyon South Rim with us. We stayed at the Mather Campgrounds. 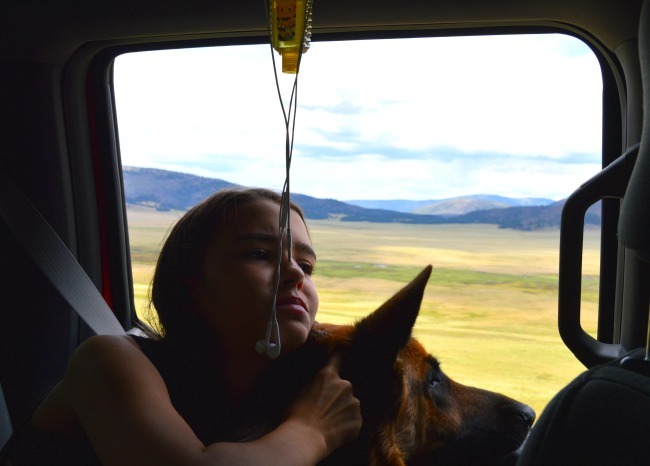 Travelling with your pet is one the most special experiences. The bond changes, and with it, you get to know one another so much better. While at home, in a controlled environment, there can be only so much to explore, the outdoors are abundant with opportunities of unique experiences, adventures and stories that make the both of you evolve. I would suggest vacation planning for a long weekend getaway, a one-day trip to begin with and then try a full holiday trip with your pets. While the idea of travelling with your pet is most exciting, there are some things that you must take into consideration before you go on vacation with your dog. 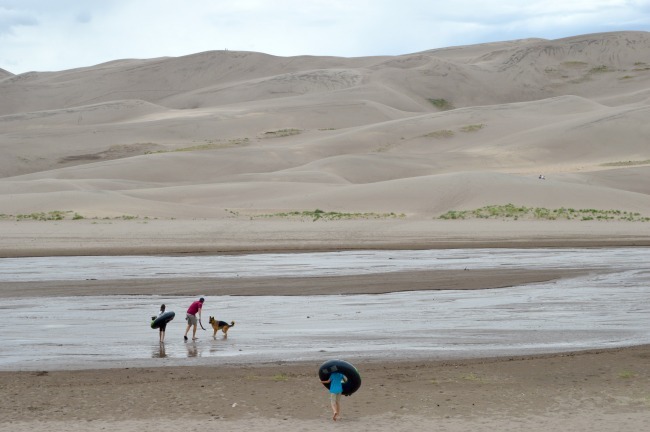 This is Scout enjoying the Great Sand Dunes with us. We stayed at the Piñon Flats Campground. What does he or she like to do, swim or hike? Does she enjoy a drive? Does she prefer the cool weather or the warm? On this note, there always a few of every kind of pet that does travel with their family and seem to enjoy it. However, in my opinion dogs seem to be the best pet travelers. Cats would most often prefer to stay at home in comfortable surroundings that they know with a cat sitter to check on them. But again, you know your pet best. Some dogs love long hikes while others may not. Our dog is a German Shepherd with tons of energy so we knew he would love the long hikes we had planned for our road trip. We also knew since our vacation was three weeks long, he would really miss us and our wallets would really miss the cash! We decided to bring him along. 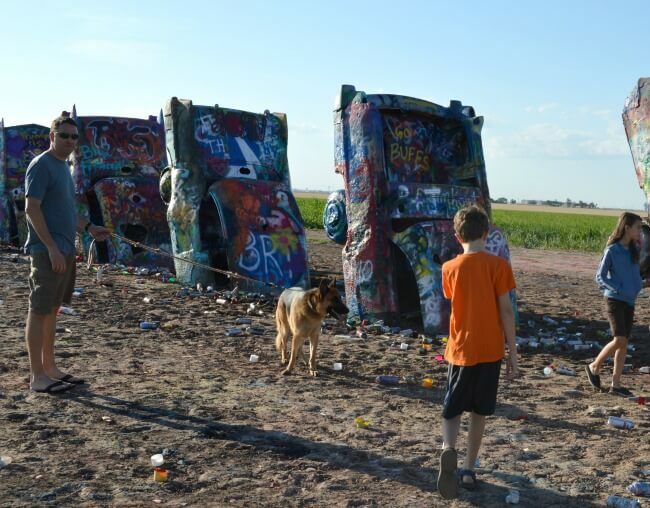 Scout exploring Cadillac Ranch in Amarillo, Texas. With knowledge of your pet in mind you can select the type of places to go on vacation- the beach, the lake, the mountains, a downtown area. Know what works for your dog and pick something you both will enjoy. 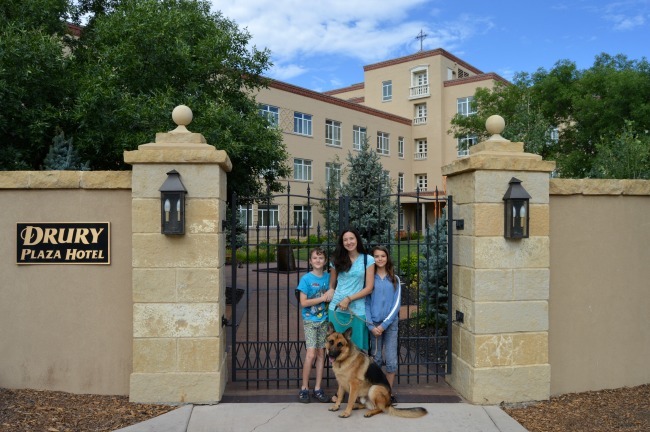 We enjoyed pet-friendly Drury Plaza in Santa Fe, New Mexico. There are lots of dog friendly vacation rentals these days. You can find pet-friendly campgrounds, pet friendly hotels, pet friendly luxury hotels, and AirBNB vacation rentals that will let you take your dog on vacation. Sites like Trip Advisor have pet friendly symbols and sites like Bring Fido are great for planning for your dog friendly vacation rentals. But be aware that some seemingly dog friendly vacation rentals, will specify that your pet must be under 35 pounds so read the fine print and call ahead if you want to be sure. Scout enjoyed plenty of bonding time with the kids while on the road trip as well as air conditioning! Your first trip should be a short one, maybe just to a nearby park for a hike. Go on vacation with your dog only when you and your fur buddy have tackled some nearby outings successfully first. Exploration stop while driving from Albuquerque to Santa Fe. If you are traveling by car and have a small pet, it is best to get him settled in a crate. This is for his own safety and you can always take breaks during the journey for him to stretch his legs. If you have a large pet, make sure you have him comfortably settled as well. Since our dog is large we decided to rent a large pickup truck with an extended cab so that there was plenty of room for us stuff in the truck bed and for the kids and dog in the cab. There was no hump on the floor before the second row of seats and there was nothing under the seat so our dog, Scout, had plenty of room to stretch out. It was surprisingly affordable especially with what we saved on boarding! Keep the vehicle well ventilated at all times, and have water breaks fairly often on vacation with your dog. If our pet’s nose is getting dry and warm, then they probably are overdue for a water break. Scout gets car sick if we feed him just before trips so we were mindful to make sure he had no food available for at least an hour before we drove. We also made sure to give him a long walk before hitting the road so that he had time to pee, poop, and get a little worn out before travel. Make sure you check with your airline for all pet travel requirements and suggestions. Have an airline approved carrier that is well labeled with your information as well as health documentation from your vet. For overnight vacations, carry some food from home that your pet is used to. In a foreign environment, this will be his way of settling down. Ensure that your pet is well hydrated all throughout the trip on vacation with your dog, as dogs are prone to dehydration when in the car and on the beach. Have a few of his favorite treats with you so that he will know things are going well. 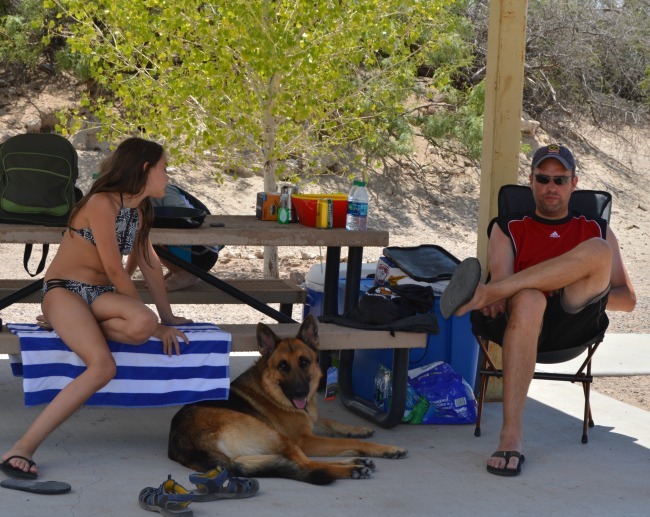 Scout loving the shade of our campground at Elephant Butte. Be alert at all times for your dog’s safety. Remember, you and your buddy are here to enjoy, and his or her comfort is of prime importance. Make sure your dog gets plenty of shade and water. Shower them with cuddles and plays to keep the excitement levels high. Keep your dog on a leash when appropriate and be respectful of pet rules. 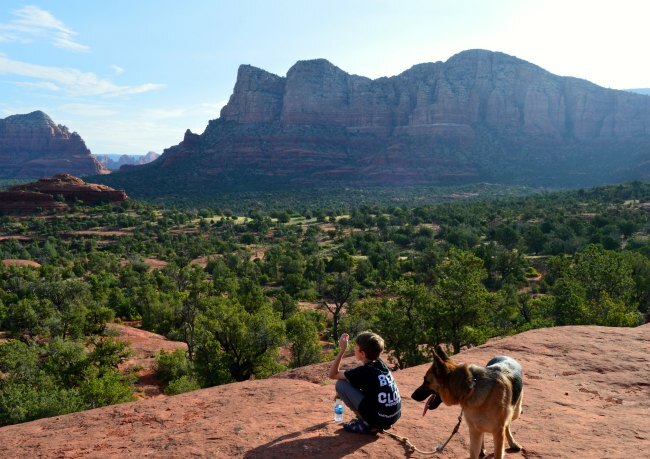 My boy and his dog having a water break together while we hiked in Sedona, Arizona. Scout leading us on the Monument Valley Wildcat Trail Hike. There are lots of dog parks and google makes it easy to find them as you drive and you want to have a dog stop. We did lots of pet friendly walking tours wether it was downtown Santa Fe, or hiking in the mountains. Sometimes we would talk turns staying with Scout with others went inside various places. Often we found pet friendly shops or restaurant patios so we could all enjoy the time together. 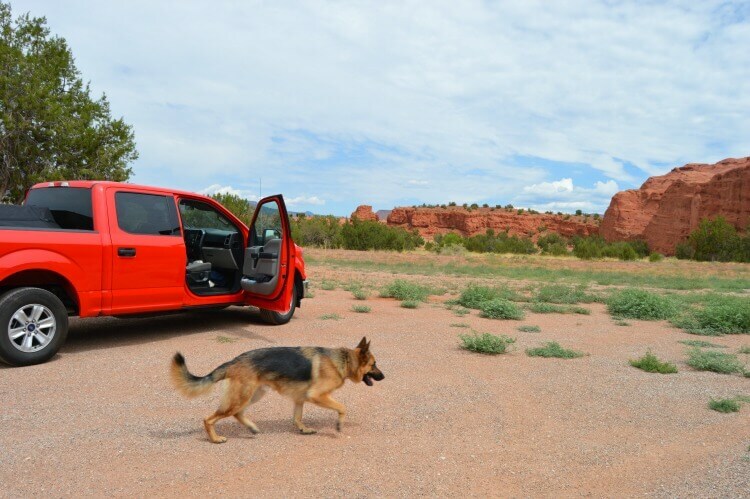 We took Scout just about everywhere with us but we couldn’t take him into the Mesa Verde National Park. We brought our crate along and were able to leave him in the crate in an air conditioned cabin with prior permission from our KOA. Plan ahead and be prepared. You can also find some day boarding places if there is an attraction that your dog just can’t do but that you don’t want to miss. There you go! These are 10 tips on trip planning with your pet. Go ahead and explore places, people and one another. Go on vacation with your dog and make some great memories and enjoy thrilling experiences! I hope you find these pet travel tips useful and let us know how your trip goes! 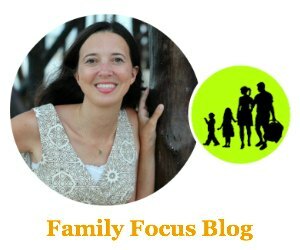 I’d love to see your photos- tag @familyfocusblog! What is your favorite dog friendly hotel? Great tips. Hotels are going the opposite direction with allowing pets. I have found that high-end hotels are becoming more pet-friendly versus the middle-tier hotels – who tend to charge ridiculous pet fees, yet subject you to constant nagging and complaints from other guests. It’s much better these days to just find a pet-friendly AirBNB. I’ve found that campgrounds are a great alternative to hotels when you’re bringing the dog along. Though, it really depends on how your family feels about camping, especially during the hot summer months!